There's something amazing about adapting Thomas Middleton's The Revenger's Tragedy. When a concept works, it can be brilliant. The overall theme in the original text is so universal that lifting the tale most settings, it can provide rich rewards. In Spicy Witch's production of Bonesetter: A Tragislasher by Annette Storckman, running in rep with the source material, the 80's slasher genre gets a facelift when a bone-faced man terrorizes a town on the fifteenth anniversary of an infamous homicide. The conceit is simple, once you figure it out that is. In 1970, a girl is raped and murdered by the town sheriff. Fifteen years later, the sheriff is now mayor and a masked man seeking revenge terrorizes his family. When another young girl is murdered, her best friend, and love interest of the mayor's son, tries to solve the mystery of the slasher while saving her love. Littered with humor and cynicism, Bonesetter, though not perfect, takes Middleton's tale and finds an enticing way to retell it. Storckman's text marries styles well but in the end, storytelling gets muffled, occasionally. The most important part of this story is the past. Without comprehension of the past, discovering why revenge is on the docket is lost. While trying to recreate the slasher genre, Storckman and director Anais Koivisto begin Bonesetter with a slightly rushed scene that sets up the saga. But unlike a film like "Scream" where the opening scene sets the atmosphere by, spoiler alert, killing off unimportant characters, the opening characters of Bonesetter are essential. If you don't track this beat moment for moment, following along can be hard. But once the ball gets rolling, the campy horror genre is off to the races. Storckman's revenge narrative keeps close to Middleton while still incorporating her personal flair. But the horror genre occasionally hinders the story. Horror films tend to have inexplicable rules that you disregard simply for entertainment value. This was certainly the case. Many dramaturgical woes sprouted up that get shoved under the rug. And a lot of it has to do with phones. They may be little but when you have to ask how an inmate in prison has access to a phone, how someone can not track the loss of a giant 80s cellular phone, and the inexplicable home phone that appears, you start to question the other things. And that leads to the character of Bonesetter himself. We learn that he wants revenge on the Mayor and everything he loves, or pretends to love. But the excuse that's given for his desire to terminate Clarissa is a bit weak. It's just lost in adaptation. Because Storckman tries to stick close to Middleton's story, Bonesetter adds an extra and unnecessary character in Spike, the adopted daughter of The Mayor. She's so insufficient that her only contribution is an unsavory love scene with her adoptive mother that helps define Danielle's cheating habits and a nod to those headshaking plot lines of the horror genre. The most shocking element of the text isn't the inclusion of this love scene but that it is the final scene before intermission. You know it's not a good intermission point when the audience doesn't clap when the lights rise. For the most part, the cinematic feel of the story works on the stage with a few exceptions. One being the dual scene between Leon and Clarissa and Bonesetter and Megan. Flopping back and forth forces the tension to be lost. Perhaps shrinking the scenes down and playing them back to back could help. Though Act II needs some help, Storckman's script is filled with immense potential. Storckman keeps the audience on the edge of their seats despite the reveal being seen miles away. But hey, that’s the genre! Director Anais Koivisto had an exciting challenging bringing Bonesetter to the stage. Koivisto embraced the campy horror essence leaving the audience wanting more. Koivisto allowed her company to foster some big characters that were grounded in some reality. The stage set up at the Flamboyan was interesting. With an elongated playing strip, Koivisto was forced into some sacrifices that hurt the cinematic feel of the show. Simply due to angles and darkness, Bonesetter could have afforded to be a bloodier mess. Again, due to angles, the fight choreography by Jon Meyer had some execution woes. The potential is present but someone in that crowd is bound to see the theatricality. One of the fun bits Koivisto instills into Bonesetter are the title cards. It harkens back to the films but if they are entirely essential, the font needs to change to something a bit more grim and lot more legible. There is no doubt that this cast was having fun playing victim. As Clarissa, Madison Welterlen, one of the spared few, brought a bubbly yet serious aura to the role. She fit the Wes Craven leading lady archetype. You couldn’t help but make comparisons to Neve Campbell’s Sidney Prescott. As the Mayor, Matthew Schott personified sleazy but didn’t really have any depth beyond that. You were glad that he was being terrorized. Brandon O’Sullivan seemed to have trouble solidifying the direction of Leon. There were some moments where he was smart, others were he was quite dim. Sadly, Welterlen and O’Sullivan lacked a connection to drive the star-crossed couple to the end. Bonesetter: A Tragislasher is one of those shows that can be exceptional in the future in a more budget friendly production. 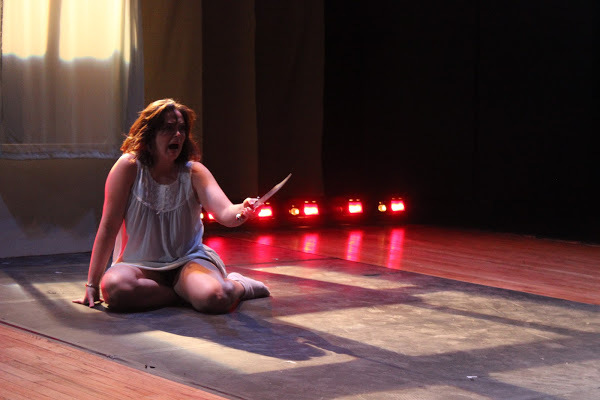 Annette Storckman has crafted an entertaining ode to Thomas Middleton and slasher films.